Located between sea and mountains, 2 coves of crystal clear water, cala Pola and cala Giverola. The accommodation is in first line, all the rooms are oriented sea and give on a terrace of 37m2. 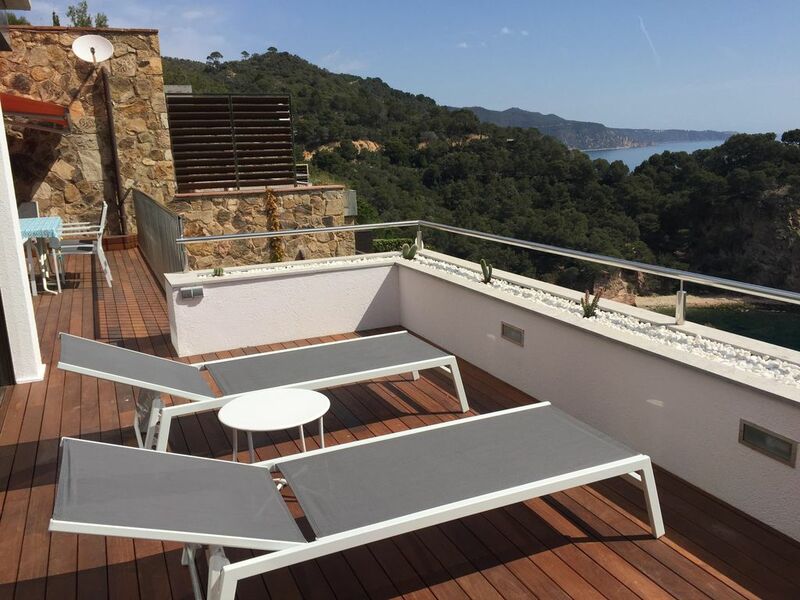 Terrace equipped with 2 sunbeds, table and 6 chairs. Lounge and dining room sea view, kitchen, oven, microwave, dishwasher, refrigerator, freezer, kettle, washing machine. TV reception of French TNT channels. 1 bedroom 160cm bed, dormitory with a bed of 140cm and a bed of 180cm or 2 of 90cm. 2 bathrooms (bath and shower), 2 toilets, 1 entrance patio. Residence located by the sea and mountain access is by stairs and access to the beach, not recommended for people with reduced mobility. Accommodation located near a hotel complex, access to the infrastructure of the complex with financial participation (swimming pool, tennis, mini golf, fitness ... etc) Not included in the accommodation.